So if you’ve not read an article up to now it’s worth stating quickly that a double gameweek is where a team plays twice in a gameweek and a blank gameweek is where premier league fixtures have been removed. Both result as PL games clash with FA or EFL Cup games. So here they are with the up to date information after the 5th round draw. The fixtures in green will definitely be on as both sides have been knocked out of the cup so no clashes. Swansea, Wolves, Chelsea and Man City. How would the blanks look in this scenario? An additional fixture of Brighton v Cardiff is added. In this scenario 3 additional fixtures would be added. 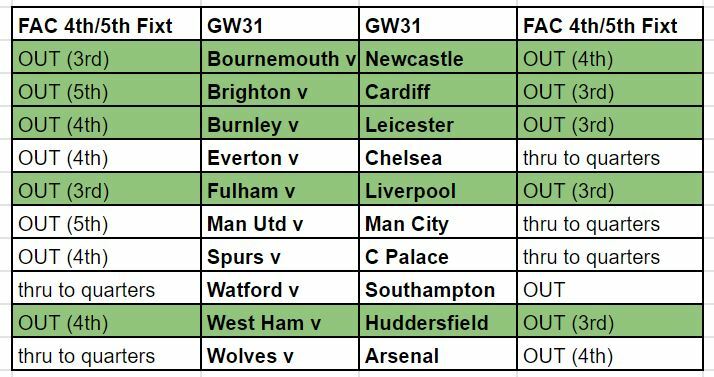 The following 8 teams would now have fixtures in both GW31 and GW33. 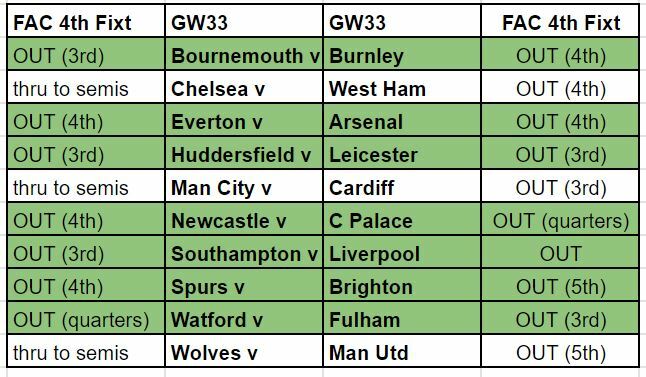 Firstly I am going to assume that the fixtures from GW31 will go to GW32 and GW33 will go to GW35. That wasn’t the case last season and with the semi finalists known after GW31 the postponements could be mixed and matched for maximum TV viewing. So which teams would have doubles in GW32 and GW35? So firstly remember the above hypothetical scenario is exactly that. Hypothetical. However, it does help for illustration purposes. On the blanks front it shows that potentially GW33 at least doesn’t look that scary and that planning in advance, rather than using a chip, for GW31 and GW33 shouldn’t be that problematic. Your team leading up to GW31 could be 3 Liverpool players plus 4 of the likes of Rashford Pogba Aubameyang etc meaning your starting 11 up to GW31 would only need 4 from the likes of Burnley and Bournemouth etc. You would still have to carry 8 of the Burnley Bournemouth etc players in your squad of 15 up to GW31 but hopefully as 4 would be permanently on your bench it shouldn’t be too disruptive. Your starting 11 in GW31 though would obviously be 3 Liverpool players plus 8 from the likes of Burnley, Bournemouth etc. Secondly GW35 will be a minority double if the postponements follow the quarters and semi clashes. That won’t necessarily happen in my view as the TV companies may want to maximise viewing schedules. If you don’t have a wildcard you could prepare for GW31 and GW33 as I mentioned above and then free hit in GW32 for the big double. However transitioning from 33 to 35 would be difficult as none of the teams with doubles in 35 would have fixtures in GW33. That means you could have 4 bench players in GW33 plus 3 transfers maximum for GW35. Not the end of the world for hopefully the benefit you got out of an early wildcard. If GW35 is limited as it is in the illustration it does make me think that the triple captain could be of more use then the bench boost. Otherwise it doesn’t particularly change my 2 options at the moment apart from maybe holding off the triple captain for GW25. I don’t pretend to be any expert on the blanks and doubles so please leave your comments on anything I’ve got wrong or anything else you think is helpful. All will be welcome. I think it’s better to put the odds to qualify and not to win , for example Chelsea odds is 1.8 and United is 2.0, or am I wrong? Anyone else thinking the yoyo Auba to Aguero for dgw25 and then back for gw26? 3 from Liverpool and ‘4 from the likes of Burnley and Bournemouth etc.’… that would be a team of 7? Do you mean that? What I mean is that leading up to GW31 team you could have 3 Liverpool players in the starting lineup and 4 non GW31 players such as Rashford Aubameyang and Pogba etc . So therefore leading up to GW31 you would only need a maximum 4 starters from the likes of Burnley Bournemouth etc in your starting 11 which means in the run up to GW31 it’s not too bad a sacrifice. Rob. Yes. Aguero is the premium to bring in for 25 purely for the straight swap to Auba for the three super duper fixtures starting in 26. He is the clear cut premium captain choice in 27. If the focus is on sterling/sane/kdb, getting auba in would be tough. Rob… that is exactly what I am doing. But I am also taking a -4 this week to upgrade Martial to Son. I already have Pogba and Rashford so he has to go. Luiz to Kolasinac next week. Harry… Geek is also including his 4 bench players to bring it up to 11. Hey mate, love your site. Just thought I’d point out the first two fixture tables for gw31 and gw33 are actually both tables for gw 31. Does the triple captain chip on a DGW counts for both matches or only one of them? I think there could be a case for TC this double GW. I believe City will bounce back against Arsenal and if they win, I think the Pep roulette could calm down for the Wednesday night game against Everton as they need that momentum again. With this theory, say Sterling scores against Arsenal, I think his chances of playing against Everton is high. Same goes for Sane and Aguero. As a Sterling owner, I’m tempted to put TC on him. FH in GW 33 and BB in GW 35. Any thoughts on this strategy as I used my 2nd WC? Ian synott, they sound like nice transfers. I have to go Aguero as I can’t get sane unless I sell Pogba. I’ve still got Richarlison who needs to become son at some point but can’t this week obviously. What’s your strike force out of interest, must be a cheap 3rd striker ? I have an exit point for Richarlison at GW29 after the Cardiff game… Options are Fraser or Jota. I will bench him for GW27 as dumping Luiz looks more pertinent that GW. Obviously if Chelsea get to the semi finals of the FA Cup, which is a big if, another double will be needed ==> when is the potential DGW for Chelsea ?? With only one Liverpool player (+ Lovren) and no-one else definitely playing in GW31 I can only get a decent team if Chelsea lose (I have Hazard and Luiz) or there are a couple of shock results in my favour. I always believe the optimal way to play the chips is to bench boost during a DGW having played a wildcard the prior week. This maximises the number of players that you get points from as you can ensure your entire squad play twice. Doing that in the second DGW is less enticing as there will be fewer teams playing twice. So my thought is to WC week 30, Free hit week 31 then bench boost week 32. Another benefit to this is also not having to transfer sub optimal players in for weeks 25-30 just to prepare for week 31. Week 33 is tricky but there will be more fixtures than in week 31 and so getting a team out should be easier. In my scenario using the scenario above, 10 teams would have doubles in 32 and then 5 would have blanks in 33 so if you matched those teams you could put a decent team together for blank 33. When you transition to 35 none of those 5 teams will have a double 35 by my calculation and only 4 teams will have doubles in both 32 and 35 none of which are the 5 blankers in 33. I agree Matt, thanks for your post. The benefit of not having to transfer in sub optimal players weeks in advance is underrated. You’ll also have the benefit of choosing an entire 11 in GW31 with up to date stats (if sub optimal players were transferred in early they may not be the best choice by the time GW31 comes about – form/injuries). Matt & James – I also have the same plan with the chips. Thoughts on Triple Captain? 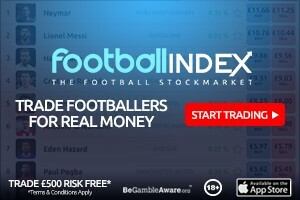 Are you playing your TC this week or leaving until GW35 out of interest? I was 50/50 on making a Man City player TC this GW – mainly due to Arsenal and Everton’s leaky defences and the expansive football they play. I decided to TC Aguero in the end because I’m in a cup competition against an opponent in the top 11,000. BUT if I had Sane I would TC him over Aguero. I think he’ll get more minutes and has a higher ceiling. Didn’t spot that. Thanks Geek.